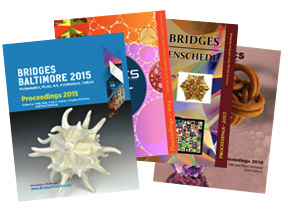 Tessellations has published two mathematical poetry books, several of the proceedings for the Bridges Conference on connections between mathematics and the arts, and art catalogs for both the Bridges Conference and the Joint Mathematics Meetings. This volume contains 22 poems by American poet and philosopher Emily Grosholz. The poems in this book blend mathematical topics from fractals to negative curvature with history, classicism, and human emotions. Includes illustrations by Robert Fathauer. Item 186, ISBN 978-1-938664-10-6, 2014, 6" x 9", 55 pages. This volume contains poems read at the 2013 Bridges Conference in Enschede by featured poets Michael Bartholomew-Biggs, Tatiana Bonch-Osmolovskaya, Carol Dorf, Sarah Glaz, Emily Grosholz, Alice Major, and Eveline Pye. It also contains selected poems from Bridges 2011 and 2012. Edited by Sarah Glaz. 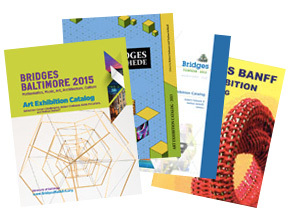 The Bridges Conference, first held in 1998, is an annual conference about connections between mathematics and the arts. The conference proceedings contains all of the papers presented at the conference. Several of the proceedings have been published by Tessellations. Item Br10, ISBN 978-0-9846042-0-3, 2010, 8-1/2" x 11", 562 pages. Item Br11, ISBN 978-0-9846042-6-5, 2011, 8-1/2" x 11", 699 pages. Item Br12, ISBN 978-1-938664-00-7, 2012, 8-1/2" x 11", 649 pages. Item Br13, ISBN 978-1-938664-06-9, 2013, 8-1/2" x 11", 645 pages. Item Br14, ISBN 978-1-938664-11-3, 2014, 8-1/2" x 11", 534 pages. Item Br15, ISBN 978-1-938664-15-1, 2015, 8-1/2" x 11", 595 pages. 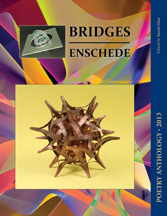 An exhibition of mathematical art has been an annual feature of Bridges starting in 2001. Catalogs for several of the exhibitions have been published by Tessellations. Item Br09 Art, ISBN 978-0-9802191-7-3, 2009, 8-1/2" x 11", 62 pages. Item Br10 Art, ISBN 978-0-9802191-9-7, 2010, 8-1/2" x 11", 109 pages. Item Br11 Art, ISBN 978-0-9846042-5-8, 2011, 8-1/2" x 11", 113 pages. Item Br12 Art, ISBN 978-1-938664-01-4, 2012, 8-1/2" x 11", 169 pages. Item Br13 Art, ISBN 978-1-938664-07-6, 2013, 8-1/2" x 11", 203 pages. Item Br14 Art, ISBN 978-1-938664-12-0, 2014, 8-1/2" x 11", 160 pages. Item Br15 Art, ISBN 978-1-938664-16-8, 2015, 8-1/2" x 11", 210 pages. The Joint Mathematics Meetings is the largest annual conference in the US for professional mathematicians. 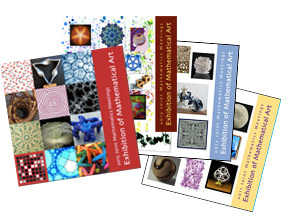 An exhibition of mathematical art has been an annual feature of the conference starting in 2004. Catalogs for the exhibitions have been published by Tessellations starting in 2008. Item JMM08, ISBN 978-0-9802191-0-4, 2008, 7" x 7", 56 pages. Item JMM09, ISBN 978-0-9802191-4-2, 2009, 7" x 7", 54 pages. Item JMM10, ISBN 978-0-9802191-8-0, 2010, 7" x 7", 62 pages. Item JMM11, ISBN 978-0-9846042-3-4, 2011, 7" x 7", 64 pages. Item JMM12, ISBN 978-0-9846042-8-9, 2012, 7" x 7", 85 pages. Item JMM13, ISBN 978-1-938664-03-8, 2013, 7" x 7", 86 pages. Item JMM14, ISBN 978-1-938664-09-0, 2014, 7" x 7", 128 pages. Item JMM15, ISBN 978-1-938664-14-4, 2015, 7" x 7", 129 pages.